Three Six Five | Thoughts on 365 objects: to keep or jettison? Thoughts on 365 objects: to keep or jettison? I haven’t posted in a while and I WILL catch up. Last night I was very excited to bring home a very dear piece of the 365. 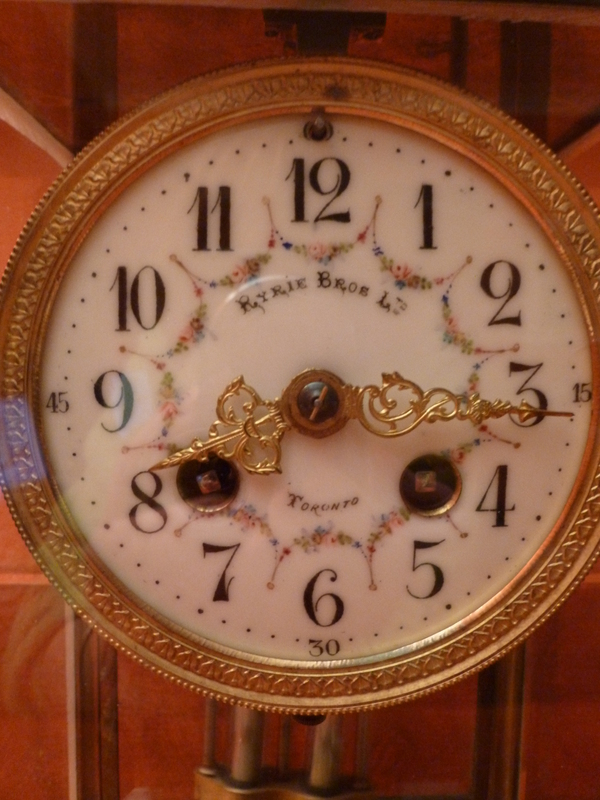 For years, I have had a mantle clock that was given to my grandparents as a wedding gift. They were married in September 1911. They received three mantle clocks as wedding gifts. The various clocks outlasted both my grandparents. One sat on the mantle of my childhood home and had a large picture fall on it when a sonic boom loosened the painting from its hook in the 1960s. Neither the clock nor the painting fared well. The painting was later restored. The clock sat in pieces for a number of years. My brother now has it. The second was given to family friends when they moved away. The third, I inherited when my mother downsized. 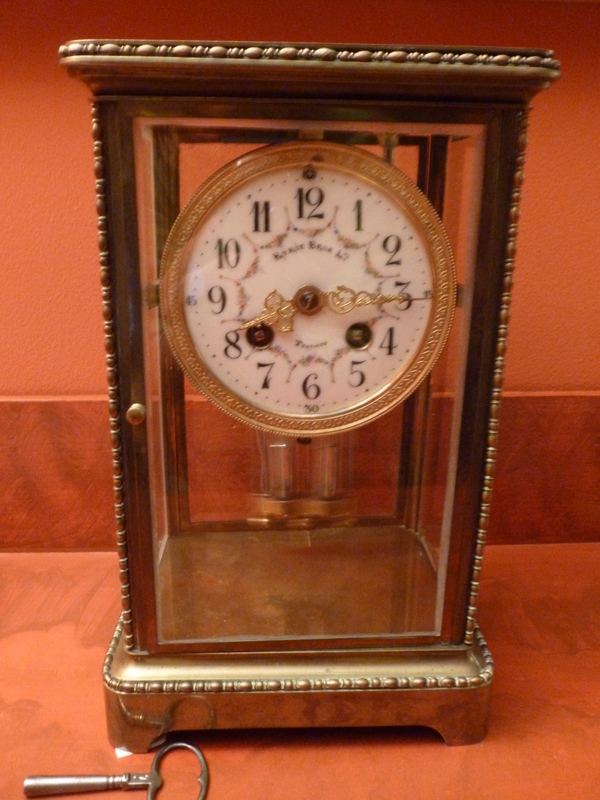 For a number of years, this third clock sat while I sought out someone who could fix it. In late November of 2012, I found just that clock repair shop. And I left it with them to determine whether or not they could bring back to running order and… what would be the cost? They called back to say that they could fix it. The cost would be $500. and I would not see it until February. They had to take it all apart and oil the seized mechanisms and replace some parts. I could understand the cost – it seemed very labour intensive, and it seemed worth it. This lovely came back to me last night in the care of the clock man who gave me all the instructions to keep my clock running for years to come. This clock is a bit of history. Not only due to familial ties but… it’s also a connection to a long-lost Canadian business. The clock is French but was clearly made for market in Canada. 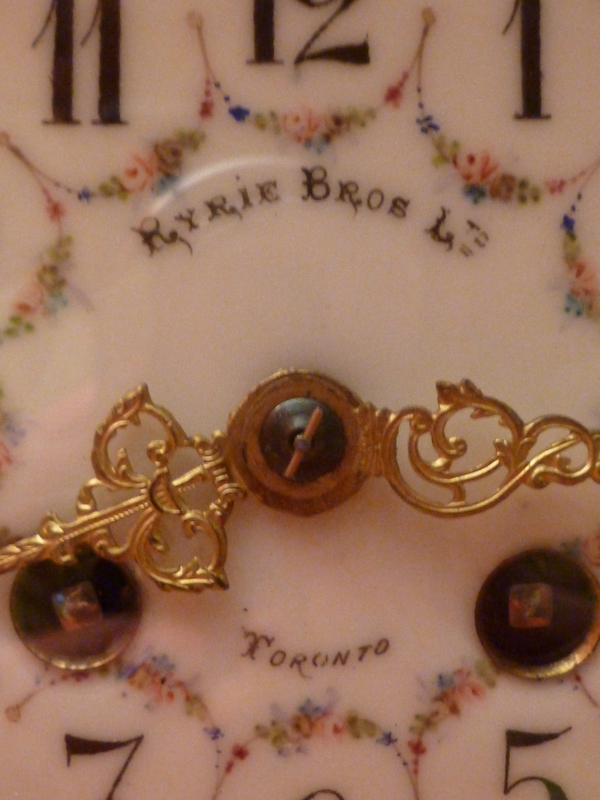 The face has the name of “Ryrie Bros., Toronto” painted onto its delicate face. Ryrie Brothers operated on Yonge Street in Toronto and were, I gather, retail pioneers producing catalogues of merchandise. Their rival was Birks, based in Montreal. The two firms eventually joined forces to become Ryrie-Birks. In an interesting sidenote, a friend of mine worked in building that had been the Ryrie building on Yonge street and still has a marvellous brass mail chute marked Ryrie Bros. More on the business history can be found online. I’m thrilled to have the clock back and working. It chimes on the hour and the half hour. I wonder in another 100 years, or even another 25, will there still be people who can bring back to life a mechanical clock such as this? Already in 2012-13, it proved difficult to track down someone to do the work. We all seem to have cheap digital clocks run by battery that we will jettison if they cease to function. And watches? People seem to have stopped wearing them. For now, I will take care to keep my clock in running order and wind it once a week. Now all I have to do is chose the day that will become clock-winding day. Ticking away… this is a keeper in the 365. This past weekend I picked up a copy of the magazine Antiques Journal. In it, the editor in chief, John Fiske, has a valuable editorial on what history and artifacts can mean to us all. The fact that current fashion does not place much value or interest on the intrinsic value of antiques or their contexts is brought home by inadequate interpretation at a historic home visit recently. I’ve placed this article as part of my blogging as most of the things that I am referring to on this blog are things from the past. Things that may be obsolete but still hold some value. Things that can tell us about the past. Are we forgetting our past in our ever striving look to the newest gadget, the latest tweet. Don’t get me wrong – I love social media and Google as much as the next person. But what’s it all for and about if we don’t clearly have a sense of where we’ve come from. When I was growing up in southern Ontario, a piece of pottery by Czechoslovakian potter Jarko Zavi was somewhat de rigueur. His pottery was not for every day use – it was very fragile and often ornamental or for special occasions only. Growing up, there was a large Zavi bowl that sat on our living room coffee table. Oh how I wish I could have that bowl back now! The design of that bowl was geometric shapes of oranges/browns and greens with white owls interspersed with the shapes. Since then, I have come to see how beautiful Zavi’s pieces really were (and are). Crafted of rough clay, they are often hand hewn and very thin/fragile. I imagine a number of them broke in their day. He seemed to focus on his natural world as a theme for the designs that I have seen. 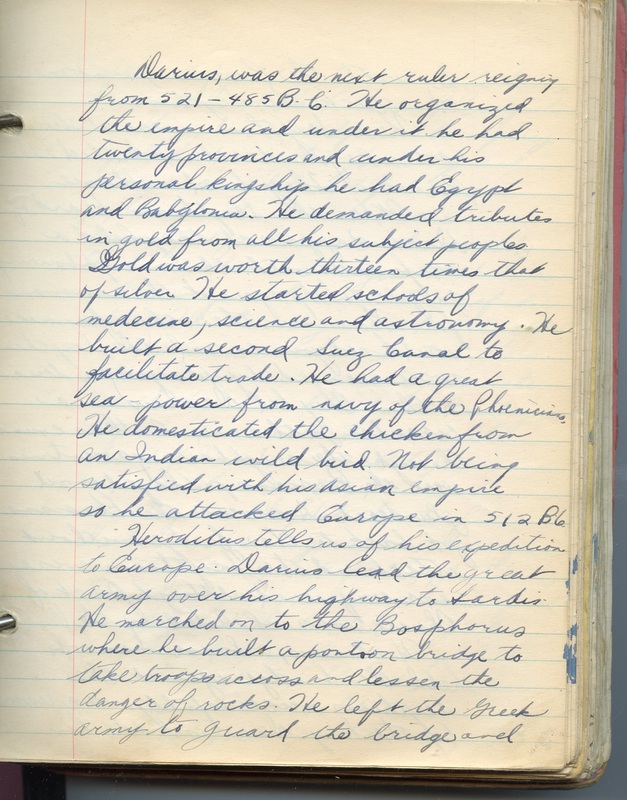 A one-page piece in the book Cobourg 1798-1948 names him Yarko (which clearly his signature indicates was wrong – you can see it’s a “J”), and describes how he was composing his glazes from Canadian minerals. I have been lucky enough to find three of his bowls over time. The one above with the rooster is perhaps the most stunning. This is quite large, open and a rounded triangular shaped-bowl. Jarko’s signature is incised on the bottom as is the date, 1951. You can find piece of his if you google him – in far off places like England or Vancouver Island. I will keep these pieces tucked away for now due to their fragility and rarity. They will remain in the Three Six Five. Have you ever seen any of Jarko’s work? Quite lovely isn’t it?! Do they teach this in art now? 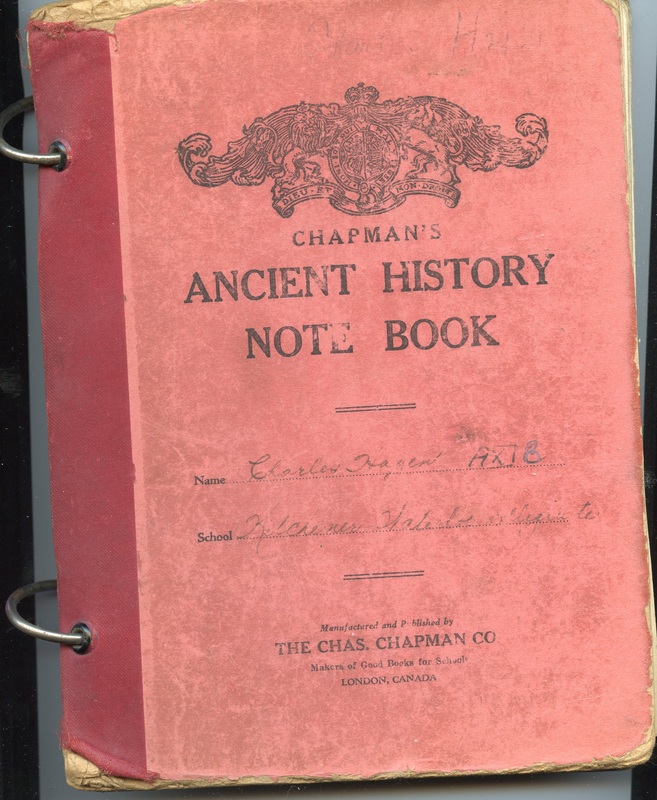 One of the books that I own is a book that my father picked up at a yard sale – where many treasures are to be found! See my earlier post. 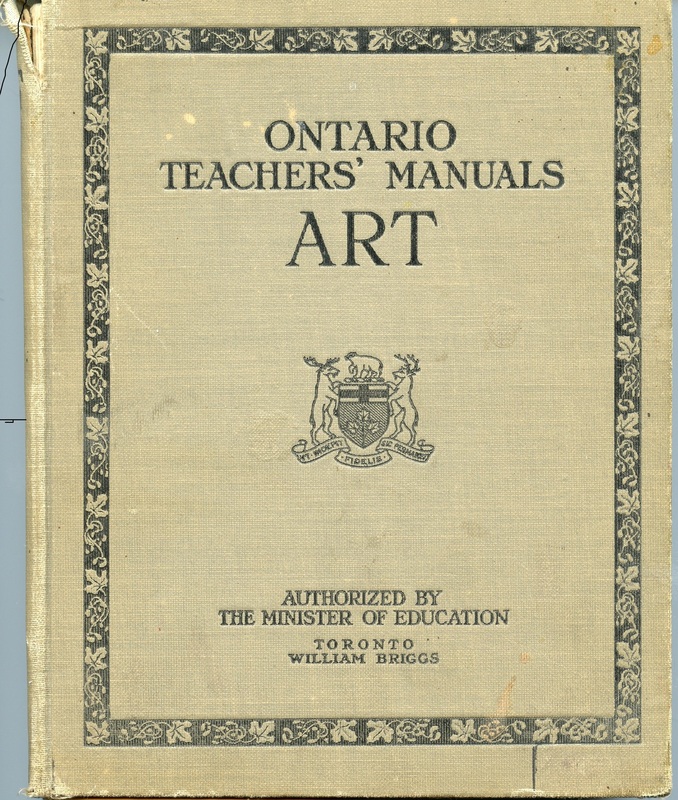 It’s a manual for teaching art from 1916. Published by William Briggs in Toronto for the Minister of Education in Ontario. It’s a wonderful book on technique that is full of wonderful illustrations – both colour and black and white. The manual lays out the curriculum for both junior and senior grades and does so according to seasons and months for the school year. Many of the illustrations are relative to the period of time when the book was published. 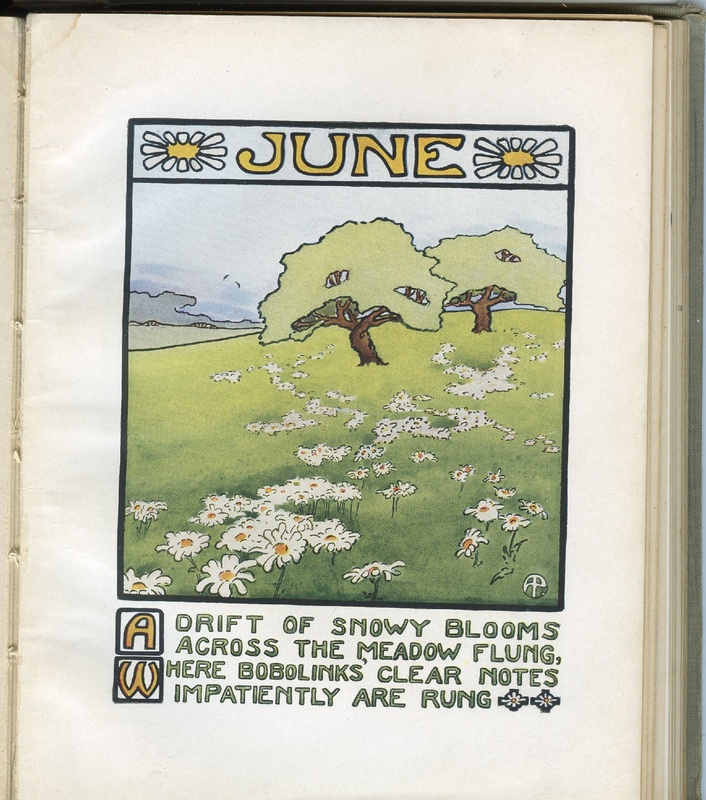 Many of them are very Art Nouveau in nature (see page illustration at right in this post). Sadly, the spine is weak and the pages are a bit loose. But it’s a lovely book to be able to page through. Now, I took art in highschool and outside as well. And I don’t think I ever learned theory in such a systematic way. The curriculum may not have allowed people to experiment and explore in the way today’s art classes do but a good sound base in theory is really important in art – to be able to push the boundaries, one needs to know what the boundaries are. Don’t get me wrong – there’s nothing wrong with experimentation. I dabble in art myself and like to “play’ when I do. This book was for the mainstream. Teaching fundamentals of colour, perspective, nature drawing and still life, illustration and the like. I wonder what students in highschool today learn – if they have/take art theory at all? Not only is form and theory important in doing art but also understanding art as well. This little piece of Ontario/Canadiana is a keeper in the Three Six Five if only for its lovely structure. When I wrote a post the other day about books, I should have mentioned that I have several varieties of books. One type of book that I love is cookbooks. I love to cook and I love to eat and I have bought and received some wonderful cookbooks over the years. As a vegetarian, I often have to go through books to see if there are a number of things for me which can justify buying a book which has far more meaty dishes than I will ever need. If you want to read a great blog about cookbooks and food, I came across this one in the fall. There’s a great piece called “History in grease stains and pencil marks” about cookbooks that you might have inherited from your family and what they can tell you about the times. I go through the bookshelves of cookbooks regularly and will jettison those books that I haven’t referred to in a long time or no longer seem relevant. And I am still buying them too – I just picked up a great new one before Christmas. It’s a vegetarian cookbook using quinoa – all the rage now. And it’s Canadian! There are a few I will never get rid of as they are good basic cookbooks full of cooking temps and times and solutions – one such is The Joy of Cooking, another is Kate Aitken’s. I did inherit one from my mom – which was her mother’s. I’ll do a blog on that in the future. It’s well-worn and not in great shape. What are your favourite cookbooks? Do you have a collection? Do you have certain go-to books? Tell me about your shelves. As mentioned, I am better about keeping these books to a favoured few. I have two shelves for cookbooks, and if I run out of space, then I know it’s time for a review of what’s on the shelves. So some of these may be jettisoned as part of the Three Six Five this year. I hope you won’t mind but I thought I would spend some time on some individual books that are on the shelves. One such book is a highschool notebook of my father’s. He went to Kitchener (ON) Collegiate. The book that of his that I found recently in a box is from his grade 11 ancient history class. While there is no date on the book itself, given the form number, I can assume that this is from around 1939-1940. There are a few things that I note when I look at this book and that make it somewhat special. Number one is the format. It’s a loose leaf book held together by two hinged rings – I guess this might have been the pre-cursor format to a binder? Number two is that this book was made by a firm in London (ON), the Chas. Chapman Co. and they still exist! They started in 1855. Google them – you’ll see. How many firms can you say this about? Number three is the fact that all the notes inside the book are written in hand in fountain pen. When was the last time you used a fountain pen?? Ever? Personally, I love fountain pens but that’s another story! Number four is the penmanship is so uniform. Take a look at a sample page (at right). This somewhat amazes me given the appearance of my father’s handwriting during his working life! It was very hard to read! And, number five, which wouldn’t be evident from the physical book … but my father ended up teaching Latin. So the significance of this book lasting is now understood – this was probably a favoured class of his. This may be where the seeds for later Latin studies were sown. How great is that! I can’t imagine that in today’s schools anything like the notes taken in this one class are done so it kind of makes the book a relic of a certain era too. In any case, having thought about the book, having scanned it and preserved its memory, I am going to jettison this book. I know, after all these years! Little beknownst to me, when I was unpacking boxes of slides that had arrived in my home via my mother’s downsizing, I found a little treasure. Today, I thought I would psot about this little treasure as a somewhat close facsimile to the red ensign. Why the red ensign? Well if one looks back in history, on this day in Canadian history it was agreed that Canada would use the red ensign as its flag and so it did until 1957. This little treasure, however, dates before that. Its clearly a candy box that was special even when it was new. 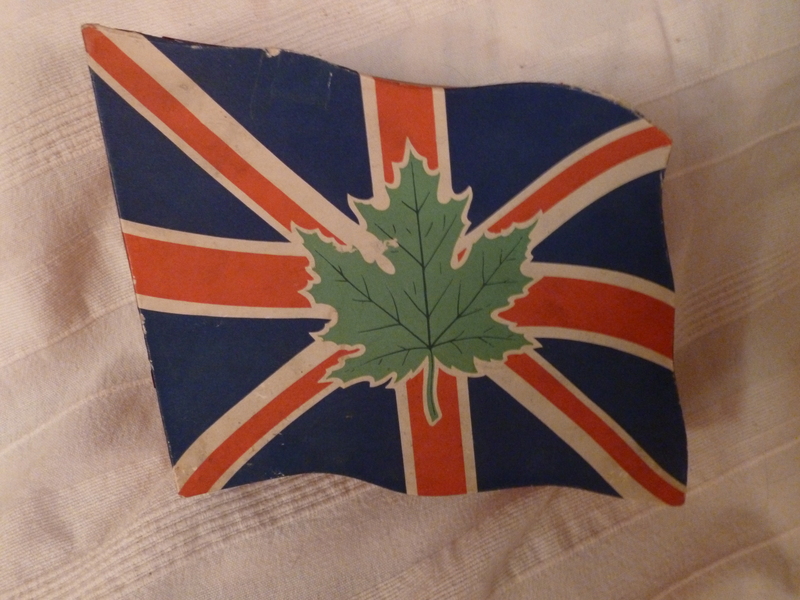 Its shape is that of a fluttering flag and combines the Union Jack and the maple leaf. This is a Canadian treasure. I don’t know its age but I am sure it dates from my dad’s childhood; he was born in 1924. The candy box is irregularly shaped and must have been an early manufacturing challenge. Its vibrant colours and patriotic symbolism are very clear. The bottom of the box is off white. The top is where the colour is – at left the photo shows the top. The sides of the top are red. 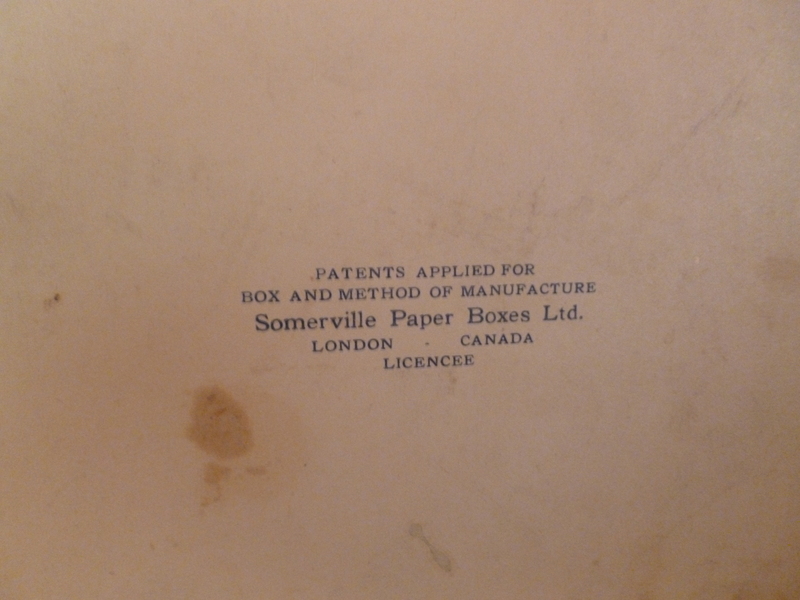 The bottom of the box (outside) is stamped with the maker’s mark (as below) and if you can’t read it, it says “Patents applied for box and method of manufacture Somerville Paper Boxes Ltd. London Canada Licencee”. What tells me that this is a box from my father’s childhood though is what is contained inside. And this was even more of a surprise than the fabulous box. The box contains little child hood crafts from primary school. Little cutouts coloured in crayon; some with magazine photos glued on, some with coloured paper glued on, some lashed together with thread. 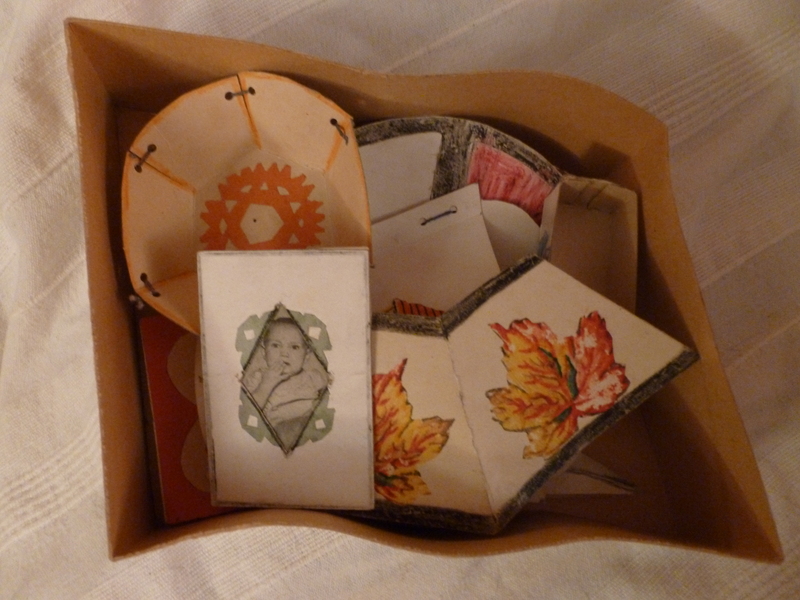 These were saved in this little box as mementoes of my father’s school age crafts. So sweet. Such an ensemble piece. Here’s a snapshot of what is contained within. A whole box of treasures! Now… the box is a keeper but the contents? Not so much. It’s just that right now, they form a “whole” which will have be disassembled. It’s January 25th and its Robbie Burns day! For anyone of Scottish descent, it’s time to raise a glass and toast the bard of Scotland, perhaps imbibe in a little swig of whiskey and scarf back some haggis (ugh!). My post today relates to a trip I took to my ancestral home on the wonderful island of Islay in the Hebrides. Islay is the southernmost island of the Inner Hebrides. My ancestors were tenant farmers on the island farm “Mullindry”. Although it’s a beautiful place to visit now, I’m sure life in stone croft wasn’t great and the promise of a new and better life in Canada was most certainly a way out and up. In 1991, my parents and I took a wonderful trip to Islay. We spent a week there – based in the community of Bowmore. To get to Islay you take a ferry from the mainland – Tarbert. The ferries are run by Caledonian MacBrayne – or CalMac. The yellow mug at left was a souvenir of that journey. Islay (pronounced I-la) has sustained itself on farming and tourism and the production of single malt whiskey – said to be some of the finest in the world (but I’m biased!). When we were there in 1991, the production of single malt was down. Some of the distilleries had even shuttered at that point time. Growth in this industry as a fine drink has been huge in the years since and many of the distilleries are enjoying a renaissance. 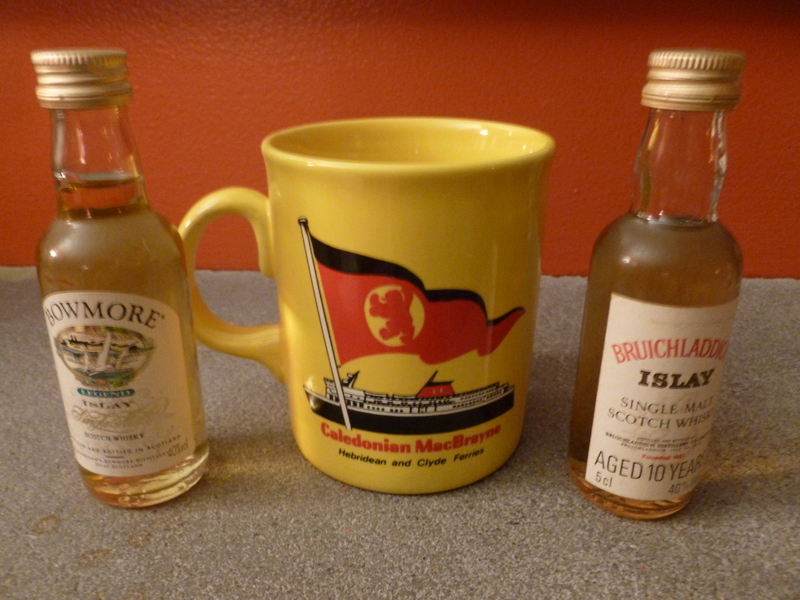 When there, we toured the Bowmore distillery (left of mug) and, on an earlier visit, my parents had visited Bruichladdich (at right) which still produces as well. Now in 2018, there are many more distilleries on the island and scotch has become a passion for many (more) people. These are souvenirs of a wonderful, not-to-be-repeated trip – a trip to experience my ancestral home with descendents. These pieces will stay in the Three Six Five collection until breakage or consumption gets them! So raise a wee dram of the wonderful amber single malt of your choice and toast Robbie, Scotland and your ancestors wherever they are from. They are your history – and I hope that you, too, may experience the revisiting of your heritage the way I did. I’m a sewer. I love textiles and I love buttons. I can’t pass by a stack of material at a garage sale without pawing through it. And going to a fabric store? Well that’s just pure torture! As a result, I have an armoire full of textiles – new and vintage – that are awaiting their destiny as some project or other! I also have a collection of buttons – far too many to ever use on sewing projects. So these, too, await their final resting place. As a kid, one of my favourite things to do was to have my mom bring out her button bag. It was a cotton bag that had been sewn by her mother; it had a drawstring top and it hung in her closet ready for use should a button go missing. Brought up during the depression, this was still something that she was used to doing. Saving buttons, reusing buttons. Cutting buttons off clothing. There were buttons with history in that bag. I would dump them out on a bed and pour through them. Matching them up. Collecting all the elaborate ones. Putting aside the boring black and white ones. She could tell me, oftentimes, where the unusual buttons came from. If our seamstress was making something for us, there might be a call to reuse some these treasures. There were buttons from her dresses, or sweaters but there were also buttons from her mother’s dresses. I have three buttons that came from that bag that have never been sewn onto anything. They are exquisite. I never feel that I have just the right thing for these to go on. But one day I will create or find something that has their name on it. 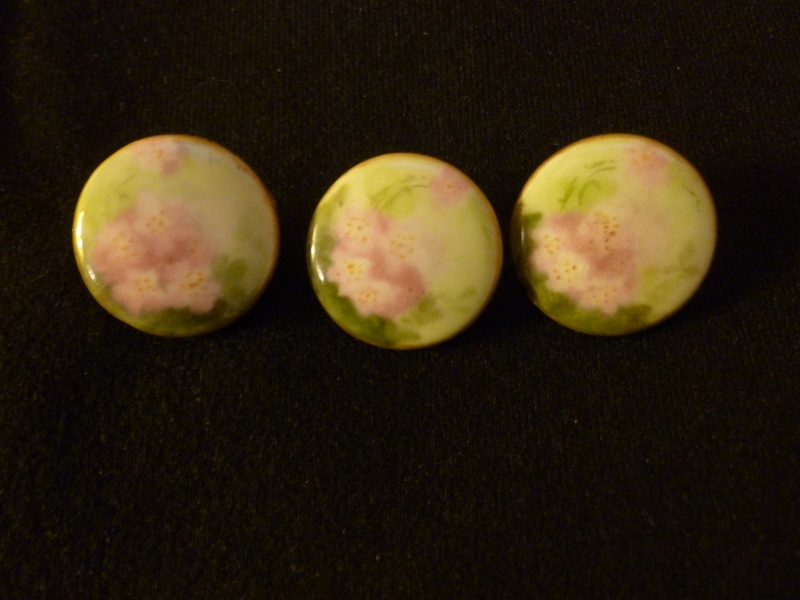 These buttons are hand painted porcelain buttons and are about a 1/2 inch in diameter. (I’m sorry the picture doesn’t do them justice). Now… while three buttons don’t take up a lot of space. Jars (10 or so) of them do! I will not get rid of these jars of buttons immediately but I do need to find a use for them. I have made a clock with different coloured buttons as the numerals. I have made bracelets with buttons. Do you have creative thoughts for copious quantities of buttons? If you do, I’d love to hear them! When my mother downsized a few years ago, I took things that I couldn’t quite see jettisoning immediately. One of these things was a box of yearbooks both from her highschool and my father’s. And from her university and his. Then, as both were teachers, there were also yearbooks from the high schools where they taught – and met. 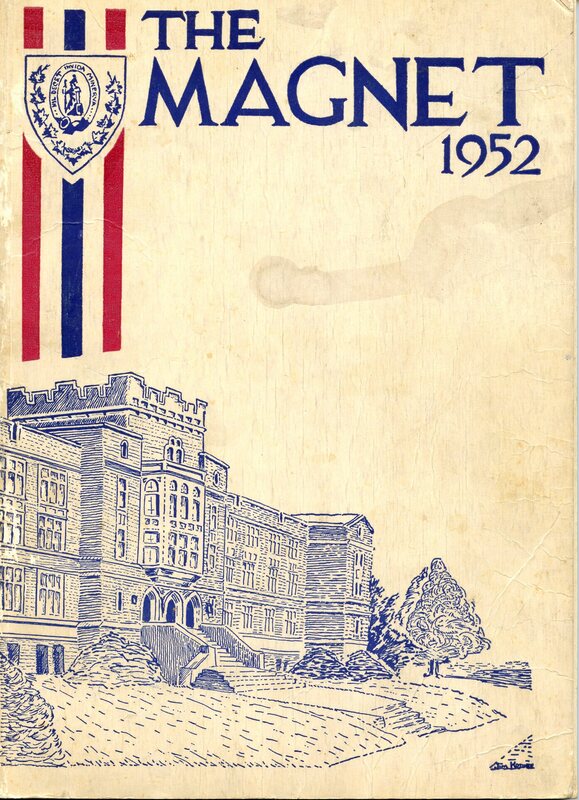 It has been my intention for years (yes, years) to scan pages that were applicable to them and then send the yearbooks on to the various schools – allowing them to do whatever they wish with them… put them in schools archives, libraries, discarding of them. I have – finally – had the time to do this. What a feeling! It has been done, the books are scanned and now I am on my way towards getting rid of a box of books! Hurrah – I think this is my first jettisoning post! Soon, these books will be out of my hands – their futures TBD but not by me!